How Can People Catch Lyme Disease? Home > Dangerous Bacteria > How Can People Catch Lyme Disease? Lyme disease is caused when a person is infected by one of three bacteria of the Borrelia species. Borrelia burgdorferi causes most of the cases of Lyme disease seen in the USA, Borrelia garinii and Borrelia afzelii are more commonly associated with Lyme disease in Europe. Transmission of Lyme disease is unusual. The bacteria are introduced into the human body by the bite of a tick. The ticks belong to several species but all are in Ixodes genus. Tick-borne disease is a common problem in many areas of the world and the rise in cases in Europe during the early part of the 21st century has been very worrying. The European Centre for Disease Control is now running a large research project to find out more about the extent of the problem, where the main risks lie and what can be done to prevent further increases in cases. The symptoms of tick-borne Lyme disease are vague but debilitating. Someone bitten by a tick carrying the bacteria can develop tiredness, lethargy, a feeling of depression and headaches between 2 and 10 days later. These symptoms are very non-specific and could be caused by a variety of other illnesses. However, Lyme disease is generally also accompanied by a rash on the skin, known as erythema migrans, which is a diagnostic sign. 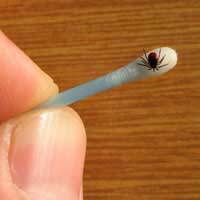 If this is missed and Lyme disease is not diagnosed so that it can be treated with a course of antibiotics, chronic infection can develop. This can cause complications such as difficulty in sleeping, very bad long-term tiredness and cognitive impairment. The Ixodes ticks that carry Borrelia bacteria bite humans when the ticks are small nymphs. Large adult ticks are usually noticed and brushed off quickly and so cannot bite so easily without being detected. Transmission of the bacteria is fairly inefficient and it has been estimated that the tick must stay attached to its human victim for about 24 hours for enough bacteria to be introduced into the human system to cause an infection. This explains why only 1 per cent of tick bites actually lead to Lyme disease. Different tick species are implicated in the passage of Borrelia in different countries. In European countries, Ixodes ricinus is the predominant species, in the USA Ixodes scapularis is mainly responsible. The former is usually a tick of sheep, the latter is a deer tick. Both are usually encountered during outdoor activities such as hunting and fishing and so Lyme disease tends, therefore, to affect a specific group of people. Generally, the population of Europe and the US are not really exposed to any significant risk by going about their daily lives. It is only when they venture out into the forests and national parks that they might come across infected ticks. Why is Tick-Borne Disease Increasing? Lyme disease is now increasing so rapidly, it is said to be one of the fastest emerging infectious diseases both in the USA and in Europe. The reasons for this are open to debate. Partly, the increase is due to human behaviour and also human impact on the environment. As urban settlements have expanded, they have eaten into traditional forest areas and have brought humans closer to the places where tick populations are high. In eastern Europe, the collapse of the former USSR led to great poverty and deprivation in many of the new states. People were forced to forage much more for food in the natural environment of the forest, bringing them into contact with ticks much more frequently. It is also possible that climate change might also be a factor. Warmer and wetter conditions generally favour tick breeding and the tick populations, particularly in Europe have themselves increased in recent years.